I told you all about Phoebe, a certified therapy dog and the mascot for Working to Halt Online Abuse, and how she needed help paying for cateract surgery, but I didn’t tell you the whole story. I’ll rectify that right now. 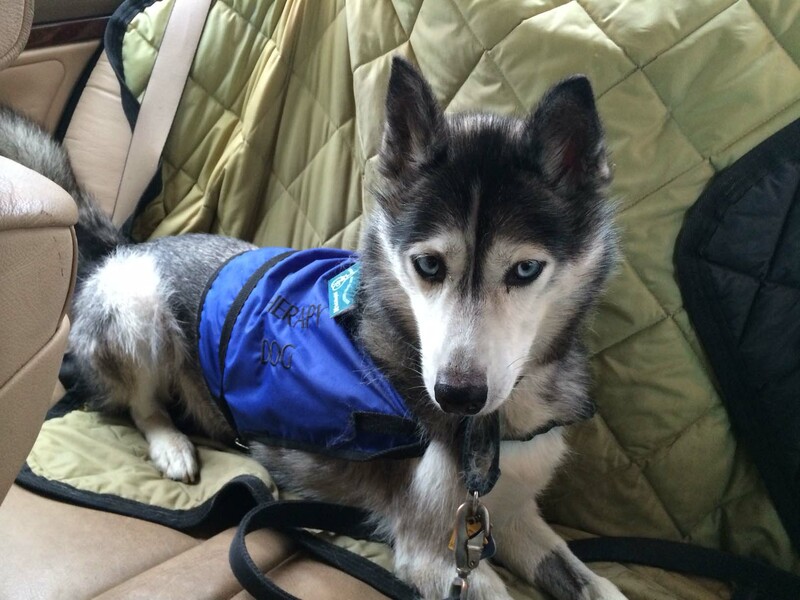 Phoebe is an 8-year-old Siberian Husky. 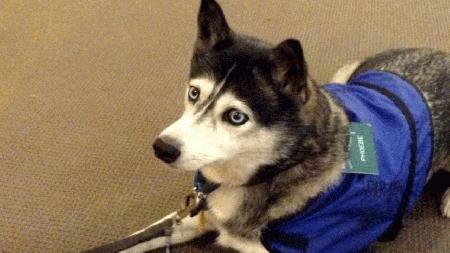 She spent the first three years of her life as a lead dog for one of three sled teams. She lived her life outdoors chained to a blue barrel. Phoebe’s “owners” divorced, and three women drove from New Hampshire to Canada to save the dogs from certain death. Only Phoebe and two others were socialized enough to be adopted out, and Jayne Hitchcock and her husband adopted Phoebe after seeing an ad on Craigslist. Here’s Phoebe headed out to work. Hard to believe this dog lived the first 3 years of her life at the end of a chain. Phoebe required lots of training. Jayne and her husband took Phoebe out as often as possible to get her used to people. They helped her learn how to maneuver stairs. They had to convince her she didn’t have to wolf down food, because it would be there. She taught her to enjoy playing with toys. 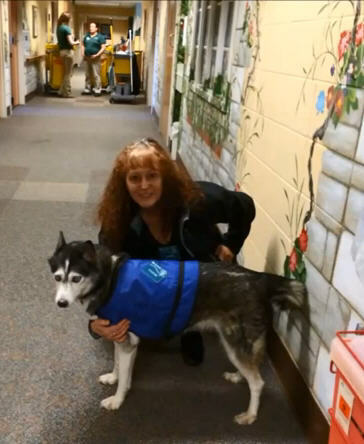 All that hard work paid off, for not only is Phoebe a social animal, she’s socialized enough to go into nursing homes, hospitals, and schools to help comfort and teach kids of all ages. Phoebe is the spokesdog for Halt Online Abuse Now. She keeps the crowd’s attention while Jayne talks to kids about how to keep themselves safe online, especially from online bullying. Phoebe steals the show when she gives kids from the audience a high five or a fist bump. Jayne will then ask Phoebe, “What do you say to cyberbullies?” Phoebe either growls, or barks, depending on her mood. 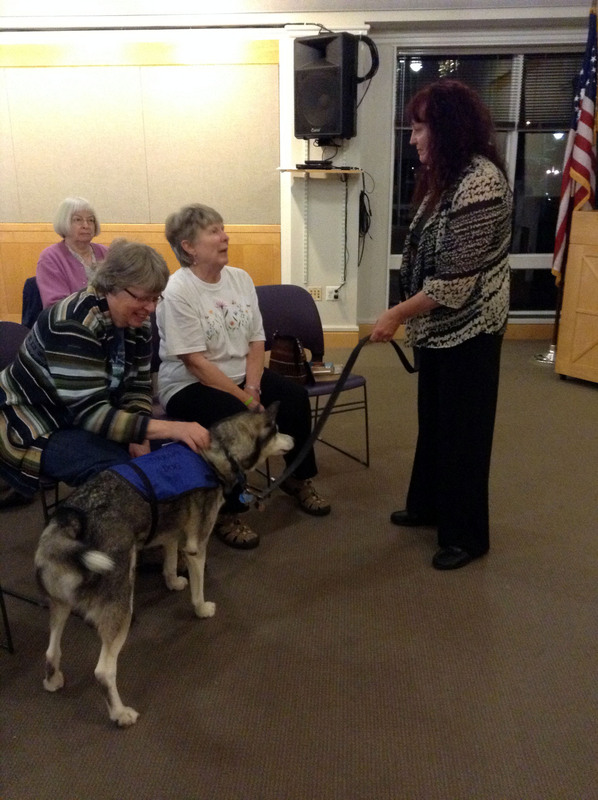 After the presentation, Phoebe allows kids to take selfies with her, pet her, and give love. Phoebe also volunteers at York Hospital and with the Salvation Army’s Tools for Life program. And she’s a hit in the community too! Jayne is a regular jogger, with Phoebe by her side. Phoebe garners lots of attention and affection everywhere she goes. This past May, Phoebe fell down the stairs while going outdoors. Jayne and her husband noticed afterward she would hesitate at the stairs, and noticed other problems as well. They took Phoebe right away to the vet, who told them Phoebe had cataracts. They recommended the cataracts be removed, as Phoebe still has years of life to live and love to give. Jayne and her husband talked it over, found someone willing to loan them the money, and had the surgery done. Jayne then set up a GoFundMe account to raise money to pay back the generous loan. The good news is the surgery was a success! Phoebe is back to her regular routine of keeping kids safe and helping people make positive changes in their lives. The not-so-good news is despite Jayne’s efforts, she’s raised less than half the money needed to repay the loan. The GoFundMe account remains open, and Jayne has offered signed copies of her book, True Crime Online, for a $75 donation. Alternatively, a friend of Jayne’s will complete a digital watercolor of a pet for a $75 donation. Oh, I know what some of you are thinking. She shouldn’t have had the surgery done if she didn’t have the money. She should have had insurance. She should get a job and not do all that volunteer work. To you, I say that Jayne and her husband do both have jobs. They also believe in the importance of giving back. Reading Phoebe’s story alone should tell you that. Phoebe will steal your heart with those beautiful blue eyes! A donation to Phoebe’s GoFundMe account helps repay a loan. It also helps hundreds of kids learn to keep themselves safe from predators and bullies online. It puts a smile on the faces of hospital patients as they recover. It helps those who are homeless, just released from prison or rehab, or new to this country develop the skills needed to find and maintain employment and become productive members of our society. All that from one dog who lived the first 3 years of her life at the end of a chain. Rumpy, thank you so much. You made me cry. Phoebe thanks you, too. words…wish me luck…you are terrific! It’s all about telling the story. People can’t help if they don’t know the story. I wish you much luck, hon! And thank you so much for sharing. Phoebe and I do appreciate it! This story brought tears to my eyes, particularly since recently rescuing a senior dog. I am so happy you shared it with us. Hopefully we can all make a little difference to Pheobe and her people. That’s my hope as well. Thank you so much for all your help!!! Hopefully Rumpy won’t mind that I am re-blogging this. Most of you know I am a softy for critters, particularly rescues. Take a look at Phoebe’s story and be prepared to be touched! Phoebe and I thank you so much for reblogging this! Of course you go to the vet and take the burden. We love Phoebe and her story. Molly, who lived chained and abused for too long, says more people need to meet Phoebe – they just don’t know how important she is. Rumpy, we don’t reblog but will try to assist! You are right, Rumpy, if people don’t know, they can’t help. And thanks for helping me share Phoebe’s story! Thank you and paws up to you and Molly! Thank you so much for helping Phoebe. Really got to me. She is an amazing dog with equally amazing peeps. Thanks Easy!!! I knew your peeps were like that just by reading your comments over the years. Donated. We therapy doggies need to stick together. Thanks Rainbow cats and OurGirl! You guys are always the first in line to pay it forward! I hope you are able to get your money Janis! Can you post a link to your fundraiser here? Poor Phoebe! I’m glad to see that she is in good hands now. It’s so hard that medical expenses are the way they are for our pets right now. It’s a little out of control. I hope she is able to get all of the money she needs! I hope all goes well for Phoebe and her family.